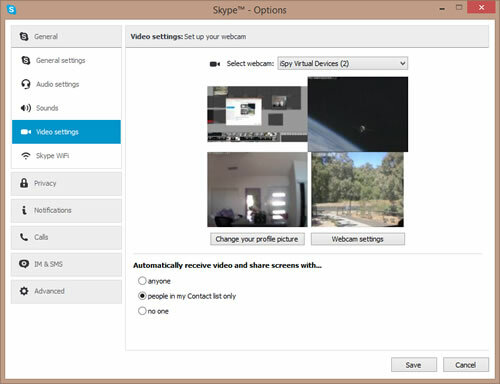 We've developed a virtual webcam driver so you can use any of the cameras you add into ispy in applications like Skype, Messenger, Flash, web conferencing tools etc. It's free and what's more, with an ispy subscription you can use this driver remotely. Run the install.bat file. Depending on your settings, Windows may block this as it has been downloaded from the internet. If this happens click "More info" and "Run anyway" to install. Enter your iSpyConnect.com login information in the settings dialog and click "Get Cameras". iSpy will need to be running and signed into your account in web settings to get a list of available cameras. Click to select a camera. The live feed from that camera will then start playing in the video preview window. The driver will remember your selection. 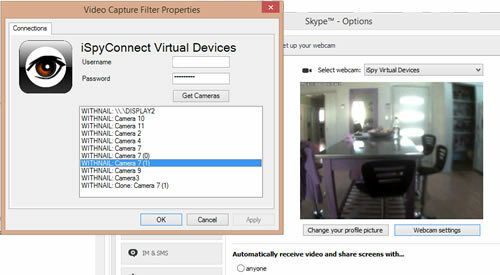 To clear your configuration remove your login details from settings and click "Get Cameras" again. To setup default cameras, open ispy and click "Options - Default Device Manager". 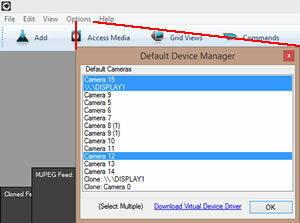 You can then select 1 or more cameras to display in the default video feed to the virtual device driver. When you then connect a third party application to the virtual device driver ispy will return a multi cam feed of your selected devices. 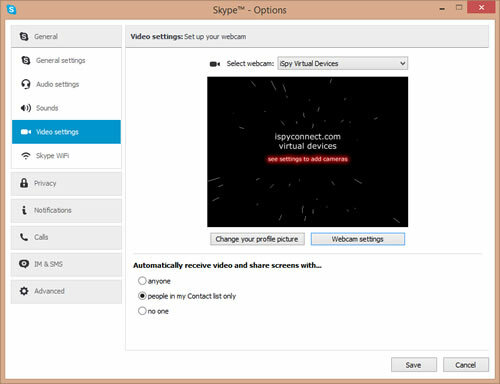 You can change your camera selections in ispy and the feed into skype will be updated live without having to go back into properties which makes it easy to swap in and out video feeds. You can uninstall the driver at any time by running uninstall.bat in the same archive.